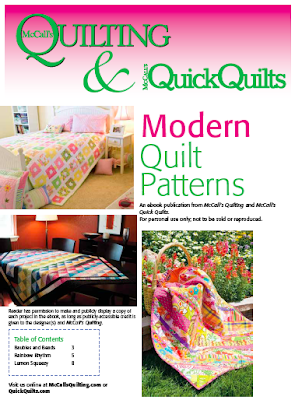 A month ago I was again contacted by Fons & Porter's Media Coordinator and asked if I'd like to review another E-Book, this time from their sister publication, McCall's Quilting. You had to know that I'd say yes immediately but I am ashamed to write that is as far as it went. Life happened and the email got buried amongst a ton of other things going on around here. Since I did promise to review the e-book and write about it plus the fact that it is likely that some of you may not be aware of this e-book yet, I'm here now to give you my 2 cents about this publication. This is honestly a great little e-book. There are only 3 quilts showcased but each of them interested me a great deal. First up is Baubles and Beads. Such a simple design and because it was done in bright colors, you know that I love it. I love it in fact so much that I actually already have this pattern saved in my pattern binders from when it was first published in McCalls Quilting. This pattern would look terrific in any variety of prints or even just solids. How about one done in Christmas fabrics? The pieces between the blocks might look like ribbons connecting the packages. If you made this quilt, what fabrics would you choose? Next up is the Rainbow Rhythm quilt. Again this quilt caught my attention. Why? Because it is a rainbow hued project of course. I'm always attracted to those. This one is done with Half Square Triangles so the piecing is easy but it is the block/color placement that is critical for this quilt's design. I can see me making one of these quilts but to be totally honest, I would likely use white instead of the black. That would be more Me. The last quilt featured in this e-book is Lemon Squeezy, a really fun and colorful quilt. They discuss it made in two ways, the first with all the strips cut to the same width and the second, as the quilt maker did, with strips of varying widths. Though I do like both versions, I prefer the varying width one more. The unexpected look of it is more appealing to me. This design is a terrific way to use up long strips of leftover fabric or you could make a "planned" version with specific fabrics or color way. No matter which you would choose I hope that this one is now on your "To Make" list like it is now on mine. You can get your own free copy of this e-book here. Again I have to thank the folks at Fons & Porter for requesting that I to review this e-book. I am honored to be asked and hope that this is just a small step to bigger and better things ahead. I downloaded this eBook a few weeks ago and love the patterns...especially Lemon Squeezy! It's on my gotta do list! Thanks for the nice review. I'll have to check it out.